For most of his 32 years, Polish painter Bartosz Beda lived in big cities in Europe. He now spends his days painting in the rural Palouse. Shortly after being named as one of Caitlin Art Guide’s most promising emerging artists in the United Kingdom in 2012, Beda packed up his paintbrushes and moved from Manchester to Moscow. That’s Moscow, Idaho, where his wife teaches art as an assistant professor at the University of Idaho. Three years and several international shows later, the artist – who London’s Evening Standard calls “a rising star” – still rents the same barren studio tucked in a quiet corner of the backyard of a home near downtown Moscow. From a tall table scattered with tubes of oils and cans of drying paintbrushes, Beda works long hours. He’s up at 4 a.m., and sometimes paints until 10 p.m., with only the company of a single photo of his wife taped to a wall by a dusty desk littered with tea bags and camera equipment. But this time Beda hasn’t sent his paintings overseas. As part of First Friday in downtown Spokane, he will hold his first solo exhibition in the United States, just a 90-minute drive away, at the Marmot Art Space in Kendall Yards. Marmot owner Marshall Peterson still can’t quite believe he was able to book an internationally acclaimed artist such as Beda. Beda, who still occasionally travels to work in his Manchester studio, has been short-listed for the Title Art Prize, The Door Prize, and The Saatchi New Sensations 2012, and won the esteemed Towry Award for the Best of the North of England in 2012. In 2014, Beda was short-listed for Italy’s Combat Art Prize, named a finalist for the Williams Drawing Prize in Connecticut, and won second prize for Viewpoints 2014 at Aljira, a Center for Contemporary Art, in New Jersey. In addition to solo exhibits in Colombia, Spain, the UK, Germany and Poland, Beda has participated in nearly a dozen group shows throughout the United States. Beda’s voice has always been fresh, ever since he started winning national art prizes when he was an 18-year-old art student in Poland. 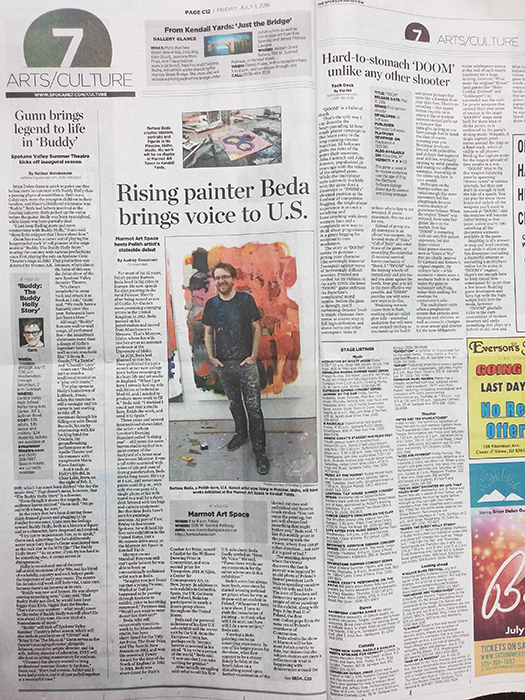 “Whenever I have a new show, I have to push the boundaries of painting … to think what will I do next, and how will I do a new subject,” Beda said. The meaning deepens when the viewer discovers the family portrait was inspired by an old photo of Poland’s former president Lech Walesa spending vacation with his wife and kids. The icon of freedom and democracy appears in a couple of other paintings in the exhibit, along with Pope John Paul II of Poland, the first non-Italian pope from the same era of Poland’s overthrow of Communism. Beda admits the show at Marmot will be his most Polish-centric to date, but insists that the subject choices are more a reflection on what is happening with democracies around the world than a nod to his own personal history. “I don’t know. It could be also a representation of my own transformation or integration with new challenges in the United States,” Beda said. Reach visual arts correspondent Audrey Overstreet at overaud2000@yahoo.com.